Please watch the following videos about Benefit Sanctions. Why am I writing about this now? It seems to me that much of the publicity concerning the unfair treatment of benefit claimants is dying down, forgotten, swept under the carpet. I came across this video quite by accident and just had to blog about it. It is good that this young man spoke out despite the consequences, more people need to do so. If you work in a job centre and unfairly sanction benefit claimants you are part of a great injustice which should not be tolerated in any modern progressive society. “What kind of person are you if you aren’t angry, devastated, furious, howling when you leave the cinema after seeing Ken Loach’s Palme D’Or winning film, I, Daniel Blake? If you aren’t angry that Stephanie Bottrill deliberately walked in front of an articulated lorry on the M6, after her benefits were sanctioned, what kind of person are you? https://www.theguardian.com/commentisfree/2016/oct/22/i-am-daniel-blake-millions-like-me-jack-monroe-ken-loach This article is well worth taking the time to read for its invaluable insight of what it is like in the UK if you are unfortunate not only to not have employment but to be sick and disabled. The film I Daniel Blake is once again highlighting the plight of people on benefits and hopefully revives public awareness of this great injustice. The 2017 award for outstanding British film has gone to I, Daniel Blake at the Baftas. I, Daniel Blake is a realistic depiction of life on benefits. Isn’t it? Clearly “I Daniel Blake” is an accurate depiction of how people on benefits are treated and the hardships they endure. For anyone who does not know, and frankly I rather suspect many people are unaware of this unfair treatment of people on benefits including sick and disabled people on ESA, Sanctions are a form of punishment – there can be no other word for it – for people who have infringed on DWP rules. Such as failing to turn up for appointments even if there is a reasonable excuse and the person has telephoned to explain, being late for appointments even if only by a minute or two , or the claimant has been determined to not have made sufficient job applications. As a penalty for these supposed infringements, most of which are in themselves unjust and unreasonable, the claimant’s benefit is stopped for a minimum of four weeks ! In some cases benefits have been sanctioned for three years. If goes without saying that sanctions result in much suffering and lead to poverty, hunger debt, homelessness, an increase in depression and other ill-health even suicide and crime in order to survive. One shocking case is that of David Clapson, who died penniless and starving without even the money to pay for his electricity to keep his fridge running in which he stored his insulin, and this is the reason he died. Below is a list of some of the more unreasonable and unfair benefit sanctions. There are many more, as so many of these injustices go unreported. “I Daniel Blake”,Ken Loach’s BAFTA winning masterpiece is out now on DVD & Blu-ray. Why sanction benefits when there’s no proof the harsh approach works? Would you like to work for thirty hours each week for no pay. No of course not, such an idea is unacceptable. Yet the government are demanding that the unemployed work this number of hours for their benefit. Jobseekers allowance is not a wage, it is paid for one purpose only and that is to support those who are unemployed whilst they look for work. It is not payment for work. If it were the payment would be ridiculously low and therefore unlawful. On the lowest rate of £56.25 per week for those between the ages 16 to 24 it would amount to working for about £1.90 per hour. Not enough for even a single person to live on, let alone anyone with a family – by age twenty-four of course a man or woman could well have a family to support. It is inadequate as a benefit, it is inadequate as a wage. In reality Workfare schemes are exploitative systems of free labour often undertaken whilst working for some of the biggest retailers in the UK, such as Tessco, ASDA and Boots. Charities have also taken part in these schemes, most notably the Salvation Army who were once the champions of the poor and the downtrodden. Oxfam have decided not to participate in the government’s workfare schemes because it undermines their work with the poor here in the UK. A sign of the changing times: when I worked for Oxfam a couple of decades ago their work did not include poor people here in the UK. There wasn’t the need. Please join Boycott Workfare’s action week to bring an end to forced unpaid labour here in the UK. Included in the above link are a number of actions you can take, please don’t feel overwhelmed, take as many actions as you can, even if it is to write only one letter or e-mail to participating councils, charities and businesses. Their is something everyone can do from writing letters to picketing retailers such as Peacocks. http://www.boycottworkfare.org/?page_id=82n – You can also download a poster such as the one above to print out or put on your website or blog or share on Facebook. Remember workfare affects us all. 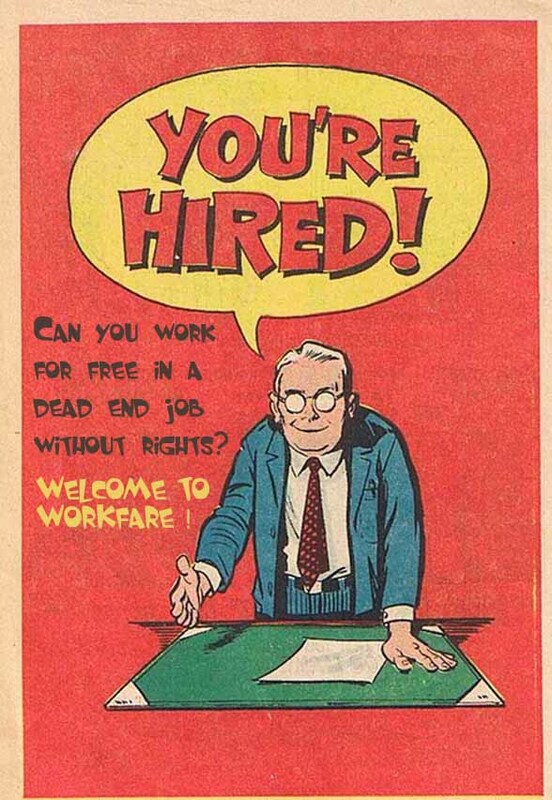 If you loose your job and claim Jobseekers allowance you could be required to participate in Workfare. If you are claiming Employment and Support Allowance ESA and have been allocated to the Work Related Activity Group WRAG you may be sent to Workfare. Workfare is not voluntary. All three political parties consider it right to force people to work for no wages, so nothing will change after the next election. Workfare does not help people to find jobs. Workfare increases the already over inflated profits of big companies and Work programme providers, it gives millions of the tax payers’ money to the one percent while depriving the 99 percent of a decent standard of living and quality of life. In some way or another we are all affected, even if not personally you are likely to know someone who is, maybe a loved one such as a son or daughter, a sibling, a friend even your granny – if you are of working age you are not exempt. Mandatory Work Activity will be replaced by the government’s new Help-to-Work scheme from April 2014 . A New scheme “Community Work Placements”launching on 1 April 2014 will force claimants to work for six months without pay. Six months – 780 hours – is more than twice the maximum community service sentence. There are in addition to the above schemes less obvious Workfare programmes such as Traineeships, a crafty way of introducing workfare for private companies. Unemployed people between the age of 18 and 21 will be forced to attend either a Traineeship, other unpaid work experience position or face a Community Work Placement. Shoezone are in the firing line on social media over their use of unpaid workers after@boycottworkfare tweeted the latest list of companies using Traineeships to avoid paying their staff. Traineeships are the latest attempt by the Tories to introduce workfare for private companies by stealth. There is no pretence that Traineeships will lead to a real job with proper wages. According to the DWP these schemes, which can involve up to six months of unpaid work, are to ‘prepare’ people for becoming Apprentices, at below the minimum wage. Does that sound like an apprenticeship to you? Not wishing to demean shop work as I have been employed myself in retail, but no way is this kind of work an apprenticeship. Apprenticeships when I left school were for skilled trades such as a car mechanic or a hairdresser. Apprentices where never paid well but they were paid and apprentices learnt a trade, a skill. Work in retail as a sale assistant is not an apprenticeship. For my first job in retail I received a proper wage, it may have been slightly less than for a more experienced member of staff, but it was a wage nonetheless and after a short time of only a few months I was paid a full wage. I was trained on the job. The above “skills” can be learnt in a couple of weeks or so most likely less, as for deliveries and replenishments these would be specific to shoe Zone and not applicable else where. Workfare in all its guises is an unjust scheme which benefits the rich by providing them with profit as a result of compulsory free labour, it is a means of coercing the poor by threatening them with the removal of their benefits without which they cannot provide food for themselves or their families, or heat their homes or pay rent – not that the meagre benefit adequately covers these costs of course but to find yourself with no money at all is unthinkable.It also means less paid jobs are available for the unemployed and it undermines wages. For example last Christmas ASDA sent home paid staff and replaced them with people forced to work for nothing on the workfare scheme. Workfare is slave labour, it is unethical, exploitative and not worthy of any modern socially progressive society which considers itself just . It is not only private businesses and charities who take advantage of this pool of free labour, councils across the country have made use of half a million hours of unpaid work as a result of this unfair system. Newport council has used 112 people, mainly in its street cleaning and rubbish collection department for about four weeks at a time. Scarborough council has used 120 people. Bexley borough council in London has taken more than 100 unpaid placements. Please help the Workfare Action Week by clicking the following link if you have not already done so and take as much action as you can.